Chichester Fencing Club was started in 1950 by the foilist and sabreur Mac Jaeger. An exuberant and charismatic international children's author, Mac developed a strong portfolio of fencing in Scotland under the legendary master Rogier Crosnier and fought internationally in France at Montpelier University with some of the greats of his day. Not content with just proving himself with the sword he added bull fighting in Nîmes and motor racing in Le Mans to his increasing adventures. A natural sabreur and marrying into the heady world of the theatre he was inspired by the derring-do of the early screen heros and was highly motivated latterly by his encounter with Bob Anderson in master classes when Bob was national coach. Bob has of course been the fight arranger for many block busters including the Zorro films. In between writing and his appointment as a Fellow of the International Institute of Arts and Letters Mac took fencing round the schools when he took up the post of French master at Oakwood Prep School. He developed a pivotal senior group at Seaford College with regular trips to France to challenge the Paris clubs of a close friend, the world sabre champion Jean Levavasseur. Nick Jaeger joined his father's staff after a 4 year language degree at St. Andrews University where he captained the University Team as well as fencing for Scotland. The club expanded in the 60's and the club moved from a humble scout hut in West Ashling to Bishop Otter College (now the University of Chichester) where it remained until the late 80's. A strong bond developed with the tremendously inspirational and hardworking National and Sussex coach , the late Professor Brian Pitman. Nick was able to take teams and individuals out into the competitive field and help Mac move the club into the modern era where electric fencing in all 3 weapons and virtually at all ages was beginning to be paramount. Our armourer David Lichfield (see below) was an essential figure in this move forward as boxes, weapons and body wires proved very fragile in those days and few people understood their behaviour! Mac finally handed over the club to Nick (pictured right) retired only recently, a few years after winning a prestigious coach of the year award sponsored by Allstar and presented by the BAF president. Mac was delighted to see the Club's great leaps forward under its new director Sharon. The breadth and depth of the fencing achievements at all ages has acquired national status and the future is...very bright! 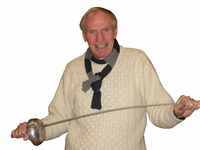 Chichester Fencing Club is very lucky to have its very own master armourer, Mr David Lichfield. David has been associated with the club for over 15 years. If David has not been called to attend a major fencing competition he can be found on Fridays at the fencing club. Fencers are very welcome to have their equipment checked by him at the club or at David's home. David regularly attends many major events every year, including the British championships, the Eden Cup and the Leon Paul International. Copyright 2019 © Chichester Fencing Club All Rights Reserved.